​a desert sanctuary for body and mind. This is Wo’ P’in Spa, the finest day spa in Santa, Fe New Mexico. Each luxurious experience merges globally inspired spa therapies with indigenous Pueblo of Pojoaque healing traditions to enhance your serenity, health and balance. Relax as our spa staff pampers you with a diverse range of massages, facials, body treatments, manicures and pedicures. Our lavish spa in Santa Fe, New Mexico also comes equipped with locker room amenities; including a sauna, steam room, and whirlpool. Guests from Santa Fe and the surrounding area may take advantage of one of our four membership options. as a hilton honors member you deserve nothing but the best! 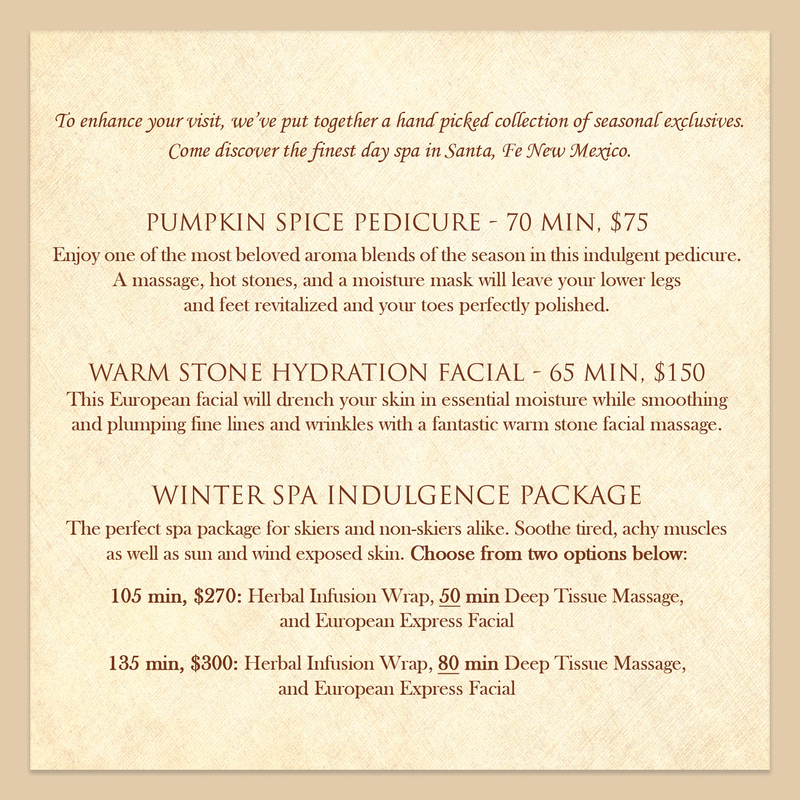 Enjoy $5 off any 50 minute Spa Treatment or $10 off any 80 minute Spa Treatment! ​If you are new to the Hilton Spa Experience please read the information below and prepare for serenity. Your mind, body and soul will thank you. ​In order to preserve a stress-free and healthy environment, we ask that all mobile devices are turned off or left at home and that guests do not smoke. We ask that you please arrive a minimum of 15 minutes before your appointment. We understand that sometimes things happen and a guest has to cancel an appointment. All appointments must be cancelled or changed at least 24 hours before the time of your appointment or the entire service will be charged to your credit card or room. We will supply you with a robe and slippers. We also have sauna and whirlpool areas that do not require attire. Please leave all valuables in your room's safe as the spa cannot be responsible for lost or stolen items. Access to spa facilities is complimentary with any spa or salon service. Lodging guests may purchase a day pass for $15 per person. Daily spa use includes access to the following amenities: men’s and women’s relaxation lounges and luxurious lockers rooms that include steam room, dry sauna and whirlpool.